After about three years of thinking that I would like to try playing the violin, I finally ordered one! I ordered the Cecilio CVN 300. The reviews I looked at prior to ordering assured me that it would be a good purchase, however more research has given me second thoughts. Other reviews, including a video review from Fiddlerman himself, have pointed out some flaws. They mostly talk about the violin being poorly assembled, particularly with respect to the bridge. Other searches have shown complaints of other Cecilio products being of poor quality. Now I'm regretting my purchase and am worried >.< My request to cancel my order was declined dasgolgndfhdh. Any words of comfort? Did I make a terrible mistake? Its too bad you didnt buy it from fiddlerman, he would have exchanged it if it was defective. 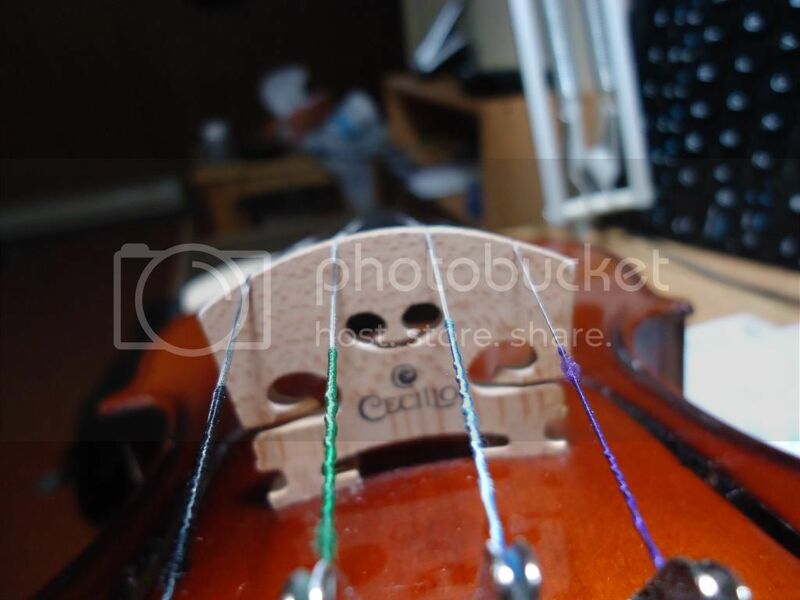 Ive had experience with two Cecilio violas. The first was a CVA 400 (under $200) not the best sounding instrument,was ugly as a shoebox, but it played. I decided to upgrade to the CVA 600 (just over $400) and was very disappointed and returned it. I hope you get one that is playable. Welcome to the forum, let us know when you get it, lots of great folks here to help. My first acoustic violin was a Mendini MV300. Mendini is Cecilio's "even cheaper" line. Under 100$ USD, I think it was about 70$. It was not by any means a great instrument, but at least with some adjustment, it was playable, and I had some fun learning and playing on it. With some adjustments and a little work and some nicer strings, it didn't even really sound bad. Even kinda good for some songs. After several months, I upgraded and bought a bit better outfit from a different maker. But.. I gave the Medini to a buddy who wanted to learn to play. He plays it a bit. But his girlfriend's daughter has played it a lot. Her mom couldn't afford an instrument for her to practice on at home, at least not at local shop prices. The girl not only uses it at home but uses it to play in the school orchestra/band. The teacher actually likes it. So, while it wasn't great or anything.. It was playable, at least with some adjusting and etc. The one you posted a link for, RiceMonster, looks like a considerably better model. It even comes with decent strings. So long as you aren't expecting miracles and are looking for a basic instrument that you can play and learn on and probably eventually get some reasonably nice sounds out of, I think you will probably be fine. At the worst, you might need to learn how to do some adjustments yourself or have a teacher or shop or etc do them. We start where we can, with what we can get. I wouldn't be nervous until it arrives. Get excited... woo hoo. Some of the things that can go wrong are very minor. I was gifted a very dirt cheap pink violin from the same company, Mendini.. and it had a few minor things adjusted... It works just fine.. sounds decent. I have a video demo somewhere. Anyway.. Welcome.. and feel free to introduce your new instrument. Get excited.. new violins coming make for the best days!!!!!!!! The Hitchhikers guide says: DON'T PANIC! Everything will be fine and you'll like the new fiddle. Later, after you've outgrown it, upgrade to one of Fiddler Man's better fiddles and you'll know that if you don't like it you can return it and you'll only be out a few bucks for shipping. Most likely, you might have to adjust a couple of things, but the Cecilio is not going to be worthless junk. I have a Mendini MV300, and although it's not the best violin ever (I'd like to upgrade if I ever capture that magical, mythical beast known as "more money"), it's a great little instrument for learning how to play. I'm really glad I bought it. I've heard good things about the "regular" Cecilio violins, so I'm sure it will suit your purposes just fine. Okey, thank you so much for re-asurance everyone! You're right in that I shouldn't panic haha. When it arrives, I will likely ask for some help to make sure it's properly assembled and whatnot. 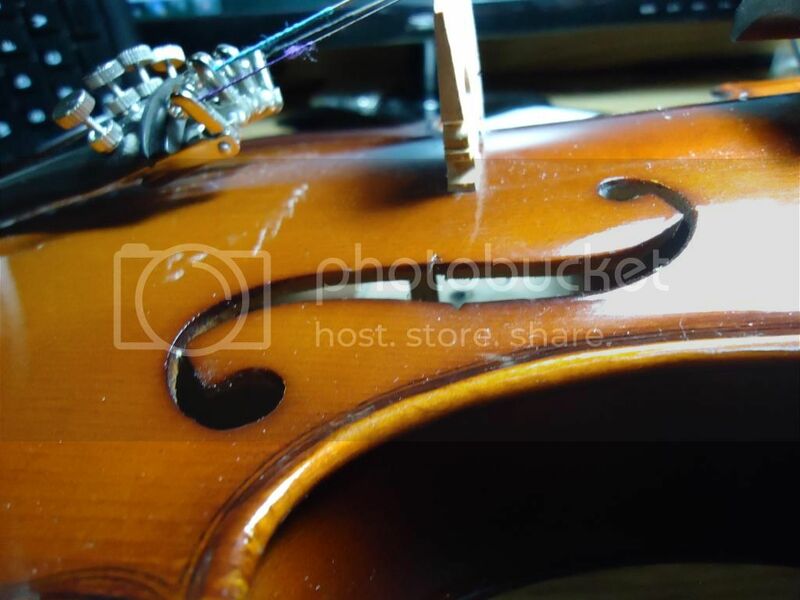 There's a music store in town that I visited last week, and I can have them fix the violin if I don't feel confident fixing it myself. Maybe I'll even post a video to show you guys once I get it, for the purposes of verifying it's quality. Maybe a C major scale or something. We shall seeeeee. Barry is right. First of all we would honor your request to cancel unless it's already been shipped and secondly we would allow you to return it if you are not satisfied. But lets not assume that it will be bad. I've played on quite a few that are great. The truth is you can't get much for that amount of money unless you luck out. Welcome to the forum. Let's hope for the best. Look forward to hearing about it. Ah okay. Now I kind of wish I had ordered it from your shop haha. Oh well. 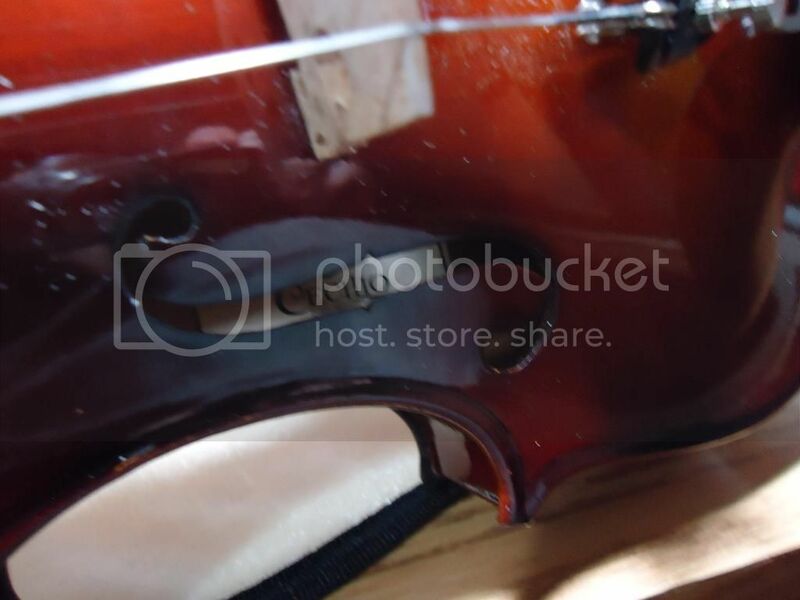 Besides an end button that is sticking out, and a bridge without notches, does anyone know what other problems I should look for when I get this violin? 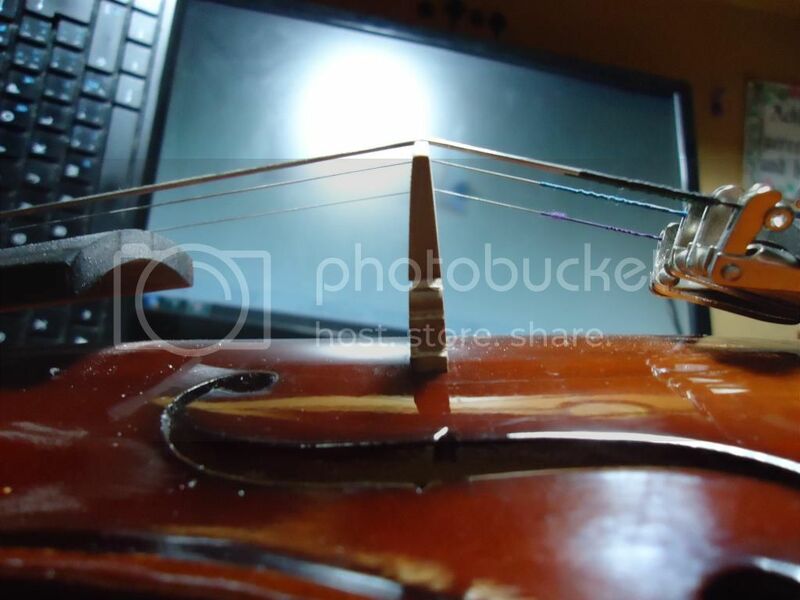 If you have the ability to post a video here, I would make one of the violin with lots of close ups on the bridge, pegs ,end pin and tail piece. I guess I did a review were there were no notches, oh well!!! You know how they say, "Don't count your chickens before they hatch". Hope you get a diamond in the rough. I think that's a good way of thinking about a lot of the cheap violins. The setup is often or usually poor, and not much work was put into building them either. 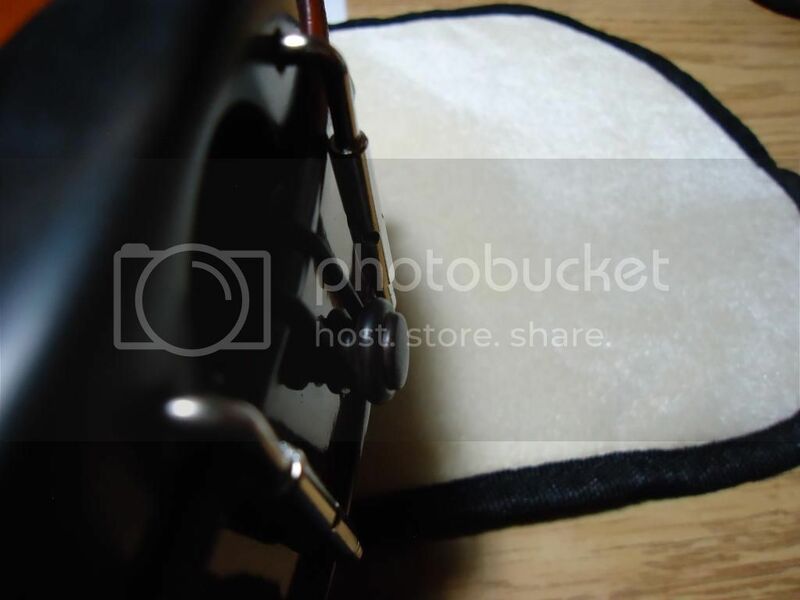 The add-ons such as the chinrest may be junk. But the materials could be in some sense decent. In other words, they may be fixer-uppers right out of the box. I have a Mendini MV400 that I haven't played much lately, but it's got pretty good sound, in my uninformed opinion. The bows the came with it were pretty bad. 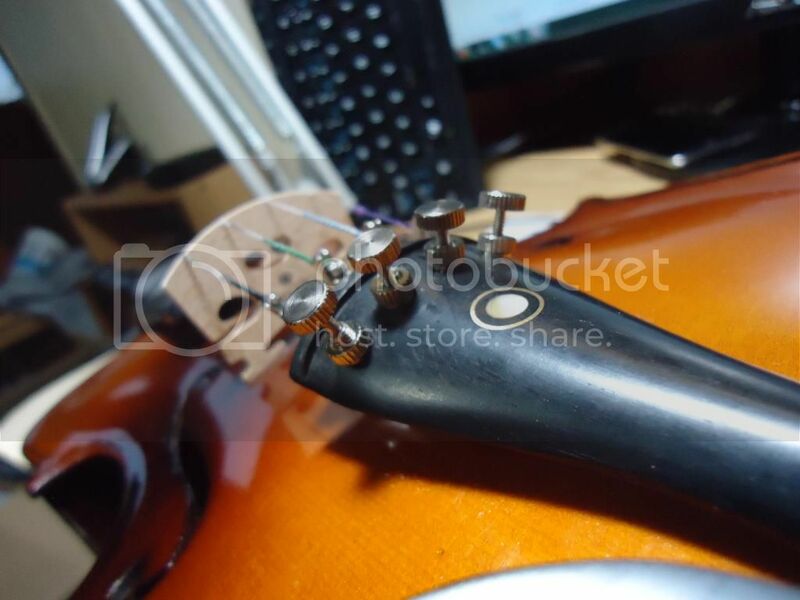 And the tailpiece broke after awhile. And the chinrest tends to fall apart. As for the violin itself, it's quite hefty, but all it really needed was new strings and a new bridge. 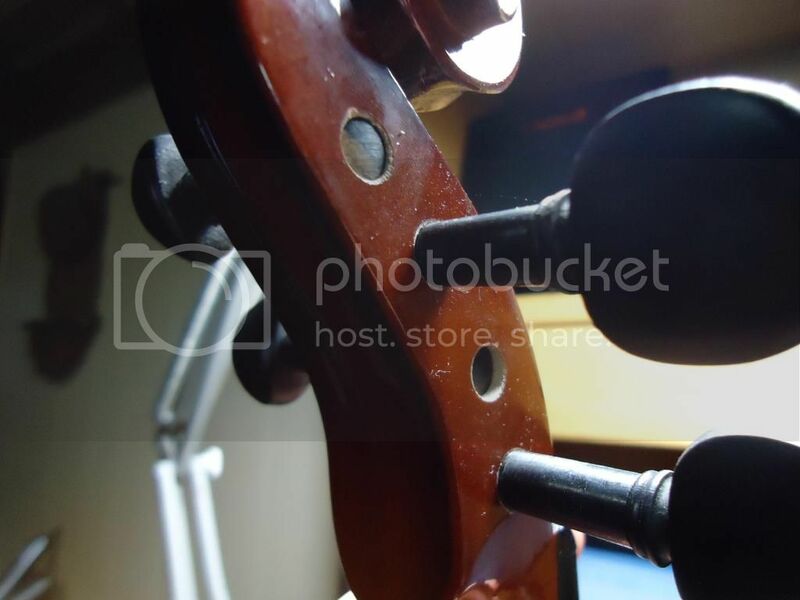 Some people open up cheap violins and recarve the top and back to improve the sound. Then they triple the price and resell them. My daughter had bought me a Cecelio 100. That is their bottom line but I got it and took it apart. I reshaped the fingerboard lowered the nut cut a new bridge for it and shortened the sound post. It turned out to be a very easy playing fair sounding instrument. Generally the bones of it are not bad. If you find something you don't like about just remember, you didn't pay much for it so work on it yourself and learn to do minor repairs. The only complaint I have is the volume from the instrument. It is hard to tone it down and play softly on. 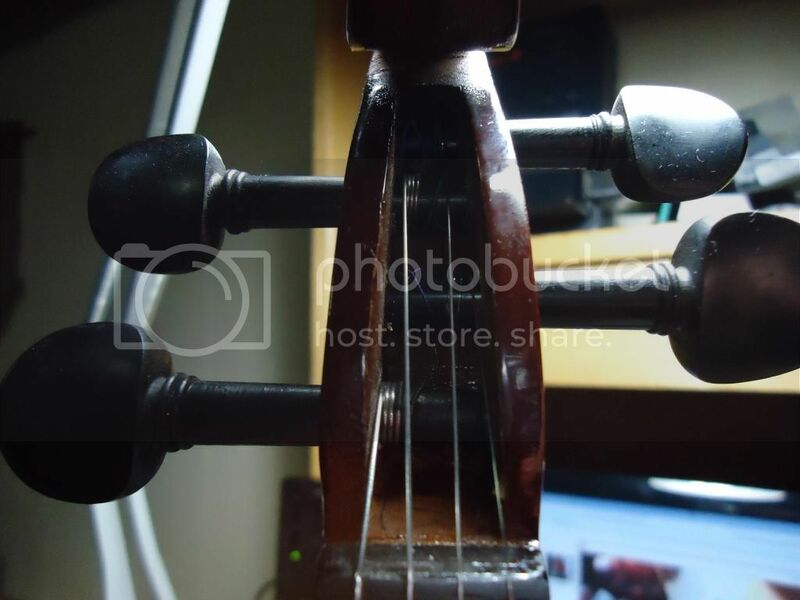 The first thing to do is order new strings from fiddlershop.com I recommend Pro-Arte, a good string for this instrument. My violin came in today! I took a video and a few pictures to show you guys. I tried to set the bridge correctly, but I only barely know what I'm doing haha. Let me know if anything seems amiss! Sorry if the video is a bit shakey. I've been practisin. Hand hurts. Love the music you added to the video. Looks good, the only thing I see that needs work is that bridge. Its way to thick , but not anything you need to worry about right off, but down the lines you'll want to learn how to carve your own bridges or take it to a shop. You probally got a spare bridge since its a cecilio, so you could google some info on it and try your luck thinning one down. Quite a few of us, myself included do a lot of our own work. Congrats on your new violin !! Well, if the looks were anything that had you worried, RiceMonster, I'd say you came out good on that. Pretty instrument. The only thing I might have seen that looked like it could be a tiny bit off was that the E-string side of the bridge looked a little closer to the fingerboard than the G-string side. I want to stress that I am by no means sure of that, since perspective with pictures can make it hard to tell something like that for certain. Another thing that can't really be seen, but you might not know.. If you put a bit of graphite where the strings cross the bridge and nut, it will usually make tuning a little easier. Just loosen each string, one at a time a little bit, so you can lift it out of the slot and to the side, and color in the slots with a regular #2 pencil. It lets the string move easier over the wood when tuning. Also it looks like the strings are just laying bare on the wood of the bridge. Over time, the plain steel ones (looks like just the E string on your violin, from the pics) will cut into the wood. So somewhere down the road, you might want to do one of the assorted fixes that can be done to stop that from happening. Overall, though, it looked pretty good, at least to my amateur eyes. 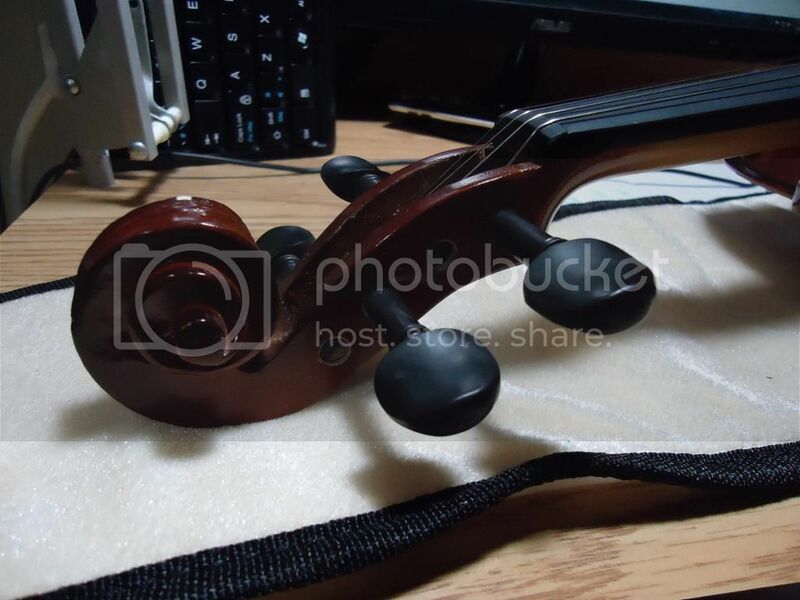 Congrats on the new violin/fiddle!